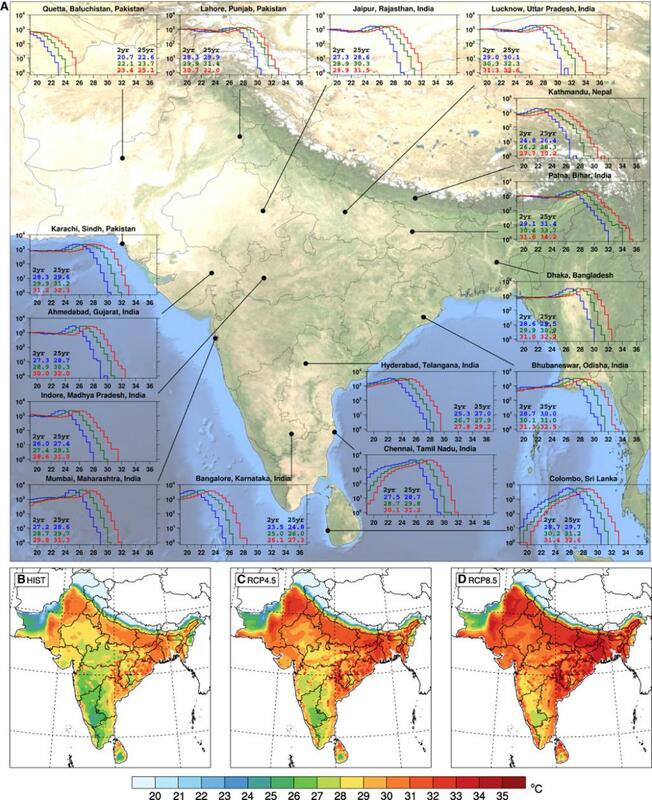 By the year 2100, heat waves in South Asia could carry heat and humidity beyond the limits of human survivability if current emission levels continue, new research from the Massachusetts Institute of Technology (MIT) suggests. India, Pakistan and Bangladesh are likely to be the most severely hit. The research models show that these summer heat waves could start hitting the Indian sub-continent as early as the next few decades. The Indo-Gangetic plains would be the second-worst affected region in the world, after the Persian Gulf area. The findings, based on results from three global circulation models, have been published in the journal Science Advances this week. While the Persian Gulf region is projected to experience the worst heat waves, the implications might be most severe in the densely populated sub-continent dominated by agrarian communities. Furthermore, the projections show that the highest concentrations of heat in the Persian Gulf region would be seen over water and not land, unlike in the Indo-Gangetic plains where the brunt will be borne on inhabited land. Eastern China has also been identified as an area that will be affected badly. Heat by itself is not the major risk factor in heat waves, but rather it is a combination of heat and humidity. Heat and humidity both have an effect on the body’s ability to maintain its internal temperature. The internal temperature of the human body is maintained at 37 degrees Celsius, while the temperature on the surface is around 35 °C. Sweating is the key process to this constant temperature modulation and the ability for moisture to evaporate is affected by heat and humidity. What’s wrong with heat wave classification in India? The new research uses an index called the wet-bulb temperature that incorporates the two. Currently, wet-bulb temperatures anywhere on earth have been found to rarely exceed 31 °C. Beyond a wet bulb temperature of 35°C, the body rapidly loses ability to cool itself. Estimates suggest that sustained exposure could be lethal for humans within hours. While it is a common practise around the world to issue a heat index to incorporate both heat and humidity along with heat advisories, the India Meteorological Department (IMD), has not incorporated it in its advisories. Heat wave classification in India is purely based on temperature. They have been made according to the geographical location and the normal heat profile of the place. When asked about the heat-index during the release of the summer outlook of 2017, the IMD officials maintained that they had found it unsuitable for the unique and varied conditions prevalent in India. Worryingly though, wet-bulb temperatures close to the limit were observed in the Persian Gulf region in 2015. The same year heat waves killed thousands in the sub-continent. The study has gone on to specify that the projections could still be averted if carbon emissions were curtailed with urgency. However, with the Paris Agreement being rocked by the US withdrawal, achieving the target seems improbable. Data shows that temperatures are now close to 1°C above the 1950-1980 average. The Global Climate Status report of 2016 published by the World Meteorological Organisation found that temperatures in 2016 were about 1.2°C above pre-industrial levels, scarily close to the Paris Agreement target of 1.5°C. By 2100, rare or “once-in-25-years” heat waves would have wet-bulb temperature of above 34°C, compared to current extremes of 32°C, the study noted. It also suggests that about 70 per cent of the population will face 32°C wet-bulb temperature by the end of the century. In India, 2 per cent of population is already exposed to this temperature. 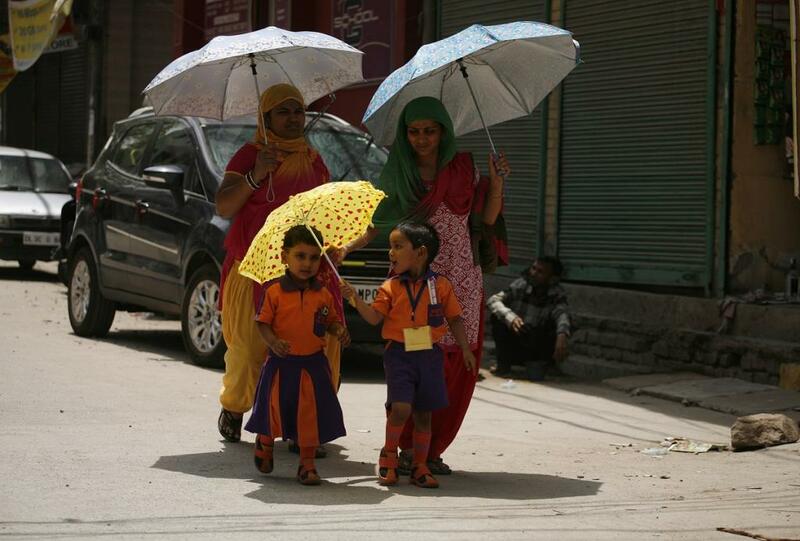 Heat waves have just started gaining prominence in India in the past few years. The new research is the latest among many studies that point to an increase in the intensity and duration of heat waves. While there has been no mention of how duration of heat waves is likely to change, the study is one of the most specific in terms of the projected risks. The agricultural workers, according to the study, are more at risk from the heat waves due to the intense agricultural activity. This is in contrast with the current observations. Heat waves over the last decade have been seen to cause more mortality among urban rather than rural residents. One of the reasons for this is the work routine of Indian farmers which keeps them indoors during the hottest hours of the day. In cities, on the other hand, heavy concentration of concrete and glass along with limited natural cover increases temperature, creating the heat-island effect. Studies have found that by 2100, cities could get up to as much as 8°C hotter than current levels! This, combined with the typically round-the-clock physical labour in cities, has caused heavily disproportionate mortality in cities rather than in the country side. Heat waves are now the second biggest natural cause of death after lightening strikes (35,384 deaths). According to government data, nearly 15,500 people have died of heat strokes, more than floods, earthquakes and cold waves. Still, it is believed that ambiguity in deaths associated with heat waves has kept the number down. It is difficult to ascertain the role of heat in individual deaths since it not only causes strokes but affects functioning of nearly every vital body organ. Studies looking at heat waves in Ahmedabad found that spikes in mortality correlate with spikes in temperature. The case has been made that the actual number could be much higher since the National Crime Record Bureau only records death by heat strokes as a heat wave-associated death. This could also be the reason for the huge discrepancy in the number of deaths associated with the disastrous 2003 heat wave that struck Europe and killed over 70,000 and the 2015 Indian heat wave in which 2,241 people died. Both the events were of comparable duration and intensity. Despite evidence of increasing risk associated with heat waves, the National Disaster Management Act, 2005 and the National Policy on Disaster Management, 2009 do not consider them to be a natural calamity. The government, therefore, does not devote financial and infrastructure resources to the problem. Thus, the onus has been on state and local governments to take preventive and adaptive action. While a start has been made with city-level action plans and disaster centres from cities such as Ahmedabad and Bhubaneswar, the level of concerted action required is still lacking.